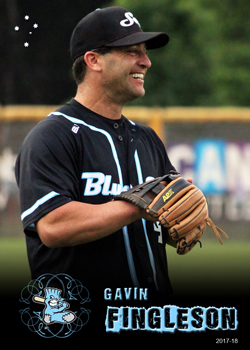 Fingleson is a veteran Australian player who came out of retirement at the age of 41 to make his debut in the current ABL with the Sydney Blue Sox during the 2017-18 ABL season. He debuted in the original incarnation of the ABL back in the 1994-95 season, playing with the Canberra Bushrangers. He would end up playing 80 games with 3 clubs across the original ABL and IBLA between 1995 and 2001. He would also play 4 seasons of independent baseball in the USA between 1999 and 2004. Fingleson was originally born in South Africa but moved to Australia when 11 years old. He was a member of Australia's 2004 Olympic Silver Medalist winning team and has represented Australia in our Baseball World Cup and World baseball Classic teams.